I think it’s hilarious that my badge says “Candy Addict” on it. Like it’s a level. Others might say “I like candy” or “Candy’s not bad”. Mine proudly says “Candy Addict”! The All Candy Expo begins next Monday in Chicago. For those that don’t know, the ACE is the “largest confectionery, cookie, and snack show in the Americas”. All the big names will be there and lots of little companies and small companies trying to get their new products picked up by the big boys. 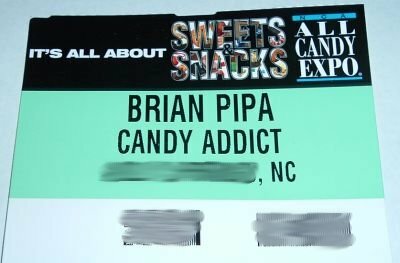 Last year, Candy Addict couldn’t make it to the show, but I SOOOOO wanted to go. This year, things worked out and we have three writers going – me, Sera, and Bonnie. We plan on taking lots of pictures and covering the show from all angles. Expect on-the-scene blogging and pictures Monday-Wednesday of next week and I’m sure we’ll be catching up on the show for weeks/months to come. We already have a few meetings planned with some major candy companies. We’ve even been invited to some parties already – fun, fun. Pass the candy cocktails! In preparation for the quantity of new products and press releases that will be released, I’ve opened a new section of the site just for press releases called (appropriately enough) Candy Press Releases. We’ll try to keep it up-to-date with all the latest candy press releases during the show and from now on. It even has its own RSS feed if you’re so inclined. We’ll probably do a once a week “Candy Press Release Roundup” highlighting the press releases from the previous week. I also (finally) ordered business cards for myself. I’ve wanted to do that for a long time but never got around to it. I finally took the plunge and ordered minicards from moo.com. They arrived today and let me say, they are the coolest things ever! They are smaller than normal business cards, are very sturdy, and the color on them is fantastic. 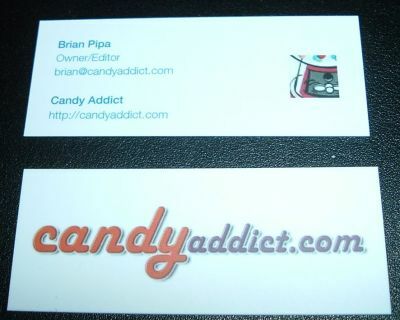 One side has the Candy Addict logo and the other side has the contact info. I can’t wait to give out my first one at the show. The other thing I did was I took the plunge and had some Candy Addict t-shirts screenprinted. You can see the mockup from the printer above. I ordered 50 of them so each of the writers will get one, I’ll take some for friends and family, and I’ll be selling the other 35 or so here on the site (and giving one away every now and then on the site). I’m going to sell them at just over cost and charge actual shipping charges – I’m not out to make money with them, just cover costs. If you’re interested in buying one, leave a comment on this post and when I figure out all the details, I’ll contact you to give you first shot. OK, I think this is the longest “Candy Addict site news” post I’ve ever done! Fun and exciting candy times are on the way! Oh, I am so jealous! Very cool to see someone else who’s going to be using the Moo cards. I ordered a set a few months ago (but with candy photos, not a logo). They really are top notch. I’m looking forward to meeting you, Sera and Bonnie in person next week! Have fun! I am really jealous. Congrats on all the attention your site has been getting since I started visiting. BTW, Were you INVITED to the expo, or did you just up and decide to go? I went a few years ago…it was amazing!!!!!!!!!!!!!! So where is the Candy Expo? Can anyone attend it? I’d really love to go. You can never have to much candy! 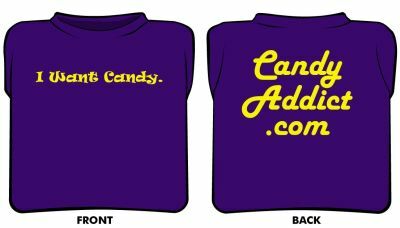 I’d also like to get one of those Candy Addict t-shirts. Any chance of that? Just let me know the cost. I’m interested in a t-shirt! I would love t-shirt information! !